What is pH? Why the Dickens should you care? Why is it that this "window" into water quality (chemistry/physics) is such a powerful tool/consideration? As we've seen, the oceans' waters are remarkably homogeneous and stable in many qualities; salt composition, temperature, dissolved oxygen,... and pH. You want the pH in your system to remain relatively high (@8.1-8.3) and constant for several valid reasons. Knowing and controlling seawater ph and alkalinity is crucial to your success. This aspect of water chemistry is not a difficult concept to grasp; though many folks confuse the terms acidity and alkalinity in their relationship to pH. You'll soon know basically (pun intended) what pH is, it's importance, and what you can and should do about it as a conscientious marine aquarist. pH is a measure. The symbol pH is a contraction standing for pondus Hydrogenii (= "weight of Hydrogen", the simplest element); pH is the relative measure of hydrogen ion concentration. Put another way, pH is the relative presence of H+ (Hydrogen ions) versus OH- (= hydroxyl ions). Note that when these two charged species get together they form a (!) uncharged water (H2PO) molecule. What happens in solutions is that at any given moment some Hydrogen and Hydroxyl ions are getting together, falling apart, floating around having other adventures. The relative presence of one over another determines the pH of the system. Simple enough? All that pH is a measure of the concentration of hydrogen (and/or hydroxyl) ions in a solution (in Moles per liter). There are all types of chemical species (salts, acids, bases...) in a solution that affect (increase/decrease) their relative concentrations. Making the average number of hydrogen ions greater (e.g. 10-6, 10-5, less 10 to the minus negative) means the pH is lower (!) See? Or more acidic (by definition, a pH lower than 7.00). Going the other direction, having less concentration of H+ (or alternatively, more OH-), meaning concentration of hydrogen ions is even less than 10-7, denotes an alkaline, or basic condition. As an example, consider a hydrogen ion concentration of 0.00000001 H+ ions, denotes a pH of 8.000. A 7.000 situation is termed a neutral pH. Makes sense to me. Maybe one last illustration (or two). Let's say the hydrogen ion concentration is 10-7.8 or 0.0000000158489 Moles/liter. What is this solution's pH? That's right, 7.8, like much of the southwestern U.S. "liquid-rock" tap water. Note that in the above expressions the change between a pH point, let's say seven to eight represents a change of an order of magnitude, or ten times. Much like the logarithmic scale used to describe earthquake strength (Richter), a small difference in number represents a large change in hydrogen ion concentration. Going from a pH of 6.5 to 8.5 is a difference of 100 times less hydrogen ion concentration! This is a big change, and you should be aware and wary of the logarithmic nature of the pH scale. pH varies from 0 ups to 7 (acidic), to just 7 (neutral) to above 7 to 14 (alkaline, or basic). Here's where people seem to get lost in the jargon. Do not confuse acidic with acidity or alkaline with alkalinity. Acidic and alkaline describe a static measure of a solution on a pH scale; acidity and alkalinity are measures of a capacity, a reserve, to resist changing from a given pH point. Let's make this very clear below. The capacity of a system to resist an upward/downward pH is termed acidity/alkalinity respectively. The same quantity is in turn referred to as acidic and alkaline reserve. Read those last two sentences again, carefully. This understanding seems easily lost among aquarists; consequently folks "drive" their pH up/down dangerously with various adjusting mechanisms. In actual practice what happens in a solution like seawater is that there are materials, chemicals suspended and dissolved and capable (like gravel, coral...) of dissolving (going into solution), some that are added as foods, treatments, source/tap water constituents, that "fight" or resist change changes in pH. This is what we mean by buffering. Buffers aid or thwart efforts in changing chemistry/physics by resisting shifts (in pH in this case). This is the reason alkalinity tests must be applied with simple pH measure, if much adjustment is needed or desired and/or you're dealing with expensive, sensitive livestock (like a reef tank). There may be so much buffering capacity at different levels or points in the system's pH make-up, that you may accidentally overshoot and drastically (sometimes tragically) raise (or lower) the pH too much too soon. I cannot begin to tell you how many times I've seen this happen. In this graph I am trying to describe a hypothetical (but real and practical) relationship between a physiological function (e.g. an enzyme system) efficiency and a range of pH. In the illustration you can see that peak efficiency is achieved only within a narrow limit, with function dropping off quickly at a slightly higher and lower pH. This is the real world! This is the real world! Fishes, invertebrates, algae, live rock (and us!) are made up of these transient collections of enzyme systems; fundamentally that's what life is (at least one definition). These systems are affected (pro and con) by suitable 1) points, 2) limits, and 3) slow changes. in pH. Maybe whipping out human blood pH phenomena will elucidate the importance of the above. The normal acceptable range is something like 7.25 to 7.35 (pretty narrow, eh? ), slightly alkaline. When and if you slow or stop ventilating your lungs (you hold your breath because your spouse won't go to the fish store), your blood pH dips in sync with the build-up of carbon dioxide (CO2) in blood solution as carbonic acid. Alternatively, hyperventilating (maybe you're going to two stores!) will blow off CO2, driving-up the pH. Both conditions have their practical limits. Your blood has only so much buffering capacity and moderating mechanisms. At some juncture in moving your blood pH too much, too fast you will stop, hopefully by ultimately only stopping doing whatever is causing the emergency shift, or passing-out. At which point your body will unconsciously shunt blood to your vital functions and allow restabilization. Fishes and other aquatic life are not as fortunate sometimes. Their metabolisms are often closely tied in with the chemistry and physics of their surrounding medium (water). This is particularly so with marine-life compared with freshwater. 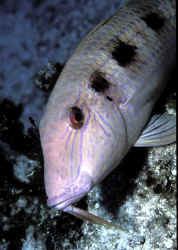 Sea organisms have two relative strikes against them; they take in water more readily, and (most) have much narrower tolerances than fresh. A shift or deviation in pH that is too much, too quickly is dangerous! Saltwater and the life in it does have buffering mechanisms to resist these changes, especially sudden shifts in pH, but be warned! Healthy, conditioned livestock can weather such changes, but it will, and does weaken them and less-than prepared organisms may be pushed over the edge. The challenge of pH shock is not obvious at the time (if the individuals survive), but other negative influences can cause their demise "mysteriously" within hours, to days, to weeks later. I can sense this is all starting to sink into you; "Ah-ha; that's the reason (one of them) why so much mortality occurs during shipping" (pH shock, from oxygen & buffering capacity running out in a small volume of water), or, "So, an explanation (in part) of why you should wait on new arrivals @ the fish store for a few weeks" (delayed pH shock loss, adjustment). Let's elaborate. In small volumes of water with lots of metabolic activity (respiring, excreting, secreting) the pH buffering capacity is successively eaten away. Ensuing, the pH itself lowers in "small jumps" and possibly a critical error will be made in immediately transferring livestock from a CO2 induced lower pH/high Ammonia laden shipping condition to a "normal", higher pH system. What can/should you do? First, check the pH of the system you're moving from and secondly, ameliorate the difference. At Quality Marine, a marine importer/wholesaler in Los Angeles they utilize acclimation tables that have pH adjusted (with hydrochloric acid) water along with standard synthetic (8.3) that they employ to "meet" incoming livestock "halfway" by mixing, allowing pH's to rise by slow control. Do you know the relationship between ammonia concentration, pH and toxicity to aquatic life? If there is any measurable ammonia with a large pH differential, do not mix the shipping water with the system water! The combination of dramatic, sudden higher pH shift and ammonia is deadly. The livestock may not die immediately, but their respiratory metabolism may be so impaired that they succumb shortly thereafter from something minor. Natural and fabricated seawater should be kept high (8.1-8.3) and stable. This can be done "simply" by not overcrowding, over-feeding your livestock, setting up your system properly with adequate substrate, filtration, and performing routine frequent, partial water changes. Over time with the addition of foods, and the operation of your filters, the alkaline reserve is nicked away such that your pH may subsequently fall. Your task is to guard against drastic, fatal drops through monitoring and/or maintenance (possibly with the use of chemical additives, contactors or feeders). In a well-engineered and kept up system that's properly populated, this is a non-question. It shouldn't have to be fooled with pH-wise. Unfortunately aquarists are human(s) and are wont to over-do, and a decreased pH is sometimes the first (or last) indication they've waited too long to change water, they're substrate, rock, coral skeleton, water's alkaline reserve is being eaten up. Beware of fast and overt changes in water chemistry and physics. Beware of fast and overt changes in water chemistry and physics. If you find yourself faced with having to adjust pH, don't change it more than 0.2 point in 24 hours. The two most popular methods for determining pH point and alkalinity involve colorimetric and electrometric assays. The latter are the electronic pH pens, meters, et al. that are the realm of chemists, advanced aquarists, and tinkerers. Colorimetric (color-measure) tests are simpler, cheaper, and accurate enough for most all of us mere mortals. Liquid, "litmus paper", "dry-tablet", and "pillow-reagent" varieties abound. All will do. I suggest assessing your long-term needs and getting an inexpensive and sophisticated model. Having standards set in permanent plastic is a bonus versus being printed on paper. The cheapo kit can be utilized for "any day" testing, and you can use a better alternate for checking on the former's precision, accuracy and for back-up. Okay? Oh, and yes; unless you possess infinite patience, a talent with crystal balls, lots of cash, an S & M involvement in the hobby or a combination of the above, keep an eye on your pH, be catholic about routine system maintenance, or buy and use an alkalinity test kit. Especially for those who intend to enter the sacred "black hole" of carbonate feeding, or automated pH controllers, crowded calcium-using organism (corals, shellfish) arrangements... Don't waste your time and money; get and use a good quality alkalinity (carbonate) test kit. Knowing the pH alone and altering the alkaline reserve unconsciously is not only a waste of effort, it may very well "melt down" every living thing in your tank. As stated and reiterated before, there is a balance to be struck in an ongoing marine system. The water, calcareous materials will put and keep your pH about where you want and need it. Chemical (carbon, resin...) filtrants, ozone, U-V, will also help to maintain high pH. Routinely removing metabolites and organic particulates through gravel vacuuming, cleaning filters helps to reduce the reducers. Water changes add more alkaline buffering. Situations where you'd be concerned with purposely lowering pH are rare; new substrates, cheap salt-mixes, run-away ozone, super-excess photosynthesis... should all recognizable/curable. Dropping pH in captive systems is the rule. The addition of food, metabolite build-up all serve to lower pH. There are many commercial preparations; pills, blocks, granular, liquid offered to the hobbyist who fears a loss of alkalinity. Also higher technology feeders, dosers/meters, reaction chambers... We'll cover more on this under E) Adjuncts to Water Quality. Whether to resort to ancillary/supporting mechanisms for your system is really a question of what you have, and what you want. If you have a crowded calcium consuming system, and/or a desire to "push" (e.g. with metal halide lighting) your giant clam, Caulerpa, hermatypic corals... it is a foregone conclusion you are going to be deficient in alkaline (among other) reserve in short order. Please see my general notes re the special needs of Reef Systems under 5) A) iii). Have you ever opened your eyes while flushing your face with water of a widely different pH? Not a good feeling in many municipalities. Imagine being immersed 24 hours a day, like your livestock. pH affects and in turn is affected by many factors important to aquatic life keeping. Keep your pH elevated and stable through correct set-up, regular maintenance, and if necessary, through outside modification. Dewey, Don. 1978. Aquarium test equipment and how to use it, pt. I: pH. FAMA 1/78.------Part VII: Alkali reserve. Halliday, Robert W. 1980. pH Pts 1,2,3. FAMA 7,8,9/80. Hovanec, Tim. 1995. About alkalinity, the buffering capacity of water. AFM 2/95. Mowka, Edmund. 1988. Understanding factors that affect pH, & guide to alkalinity and pH control. SeaScope, Aquarium Systems, Vol. 5, Fall 1988. Thomas, Andrew & Jim Purcell. 1989. Electronic pH measurement and control. FAMA 7/89.